Inflation rates can differ across regions of monetary unions. We show that in the euro area, the US, Canada, Japan and Australia, inflation rates have been substantially and persistently different in different regions. Differences were particularly substantial in the euro area. Inflation differences can reflect normal adjustment processes such as price convergence or the Balassa-Samuelson effect, or can reflect the different cyclical position of regions. But they can also be the result of economic distortions resulting from segmented markets or unsustainable demand and credit developments fueled by low real interest rates. In normal times, the European Central Bank cannot influence such developments with its single interest rate instrument. However, unconventional policy measures can have different effects on different countries depending on the chosen instrument, and should be used to reduce fragmentation and ensure the proper transmission of monetary policy. The new macro prudential policy tools are unlikely to be practical in addressing inflation divergences. 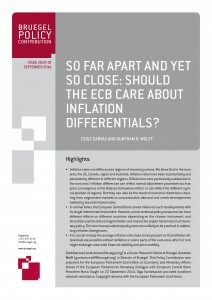 It is crucial to keep the average inflation rate close to two percent so that inflation differentials are possible without deflation in some parts of the euro area, which in turn might endanger area-wide financial stability and price stability.